“This year will be a hard, crazy year but remember in the end it will be incredibly exhilarating." 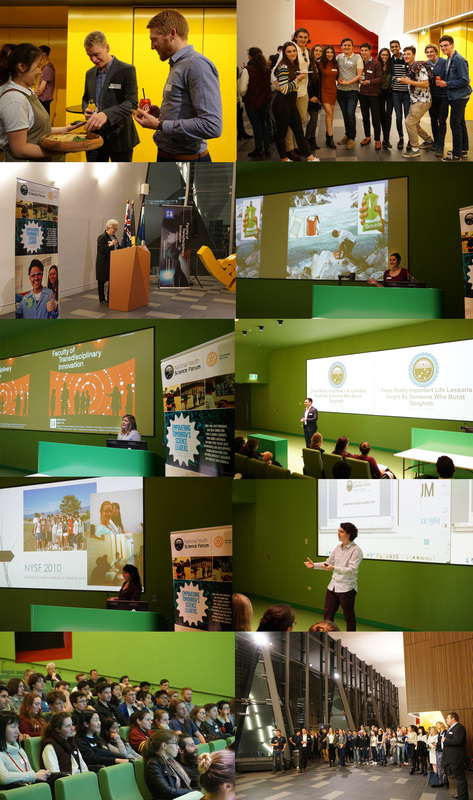 In partnership with IP Australia the NYSF hosted the second Alumni Event in July. The event was held at the University of Technology Sydney (UTS), where our newest cohort of NYSF participants had the opportunity to listen to older NYSF alumni about their education and career journeys. The Alumni Event was part of the Sydney Next Step Program which you can read about here. Professor Louise McWhinnie, Dean of the Faculty of Transdisciplinary Innovation welcomed everyone to UTS, and then several NYSF Alumni spoke about their study and work since leaving high school. Stephanie Pearce (NYSF 2010) now works as a patent examiner at IP Australia. Stephanie shared insights about life after NYSF, particularly her career at IP Australia, and the importance of protecting intellectual property. Associate Professor Alison Beavis, (NYSF 1997) who is Deputy Dean for the UTS Department of Transdisciplinary Innovation said she felt a part of the NYSF family and offered some sage advice to this year's cohort. Our keynote speaker, Associate Professor Josephine Clayton, attended the very first NYSF (previously known as National Science Summer School - NSSS) in 1984. She spoke about her professional and personal journey in medicine, and an experience with a dying patient’s attitude to medical care that changed the course of her career. Associate Professor Clayton is the Director of HammondCare’s Centre for Learning and Research in Palliative Care. Her research aims to explore the best ways to facilitate open discussions around palliative care that aligns with the patient’s wishes as opposed to looking at the issue from a purely medical point of view. “I am blessed to have a job that has dedicated time to researching and teaching. I love collaborative research that focuses on translating research into clinical practice,” Associate Professor Clayton said. The other presentations highlighted the diversity of our alumni's experiences, touching on everything from overcoming obstacles and changing paths, through to advice on what employers are currently looking for and following your passion. All in all NYSF alumni had a great evening, gaining great advice about study options and career, networking and meeting other alumni and catching up with old friends. NYSF thanks our alumni speakers including Rhys Killian (NYSF 2013), Emily Smith (NYSF 2010), and Jacob Silove (NYSF 2014) and our fabulous MC Jason Borg (NYSF 2010). A special thank you also to Professor Louise McWhinnie, Associate Professor Alison Beavis, the staff at UTS who made the evening such a great success and IP Australia for its continued support.